Those in the speech application industry know that when customers pick up the phone, they are on a mission – whether they’re trying to figure out an account balance, what a company’s business hours are, or how to pay a bill. Phone calls are immediate – and customers pick up the phone when they are looking for an immediate solution. So what happens when the call is dropped? Regardless of the reason, customers blame the business – and the delay only heightens the customer's sense of urgency. Most customers expect they will have to start all over from the beginning. If you can surprise them with one of the following alternatives, that frustration can turn quickly to satisfaction and customer loyalty. A customer calling back into an IVR system after an unexpected disconnect most likely expects to hear the call flow starting from the beginning. However, if your IVR is tightly integrated with your customer database, you should be able to recognize the phone number when the customer phone back – and offer them the opportunity to hop right back into the call flow. And if your phone lines fill up while the customer is phoning back in, you always have the opportunity to offer to call them back when a line opens up. Don't forget – IVR systems can include outbound calls! 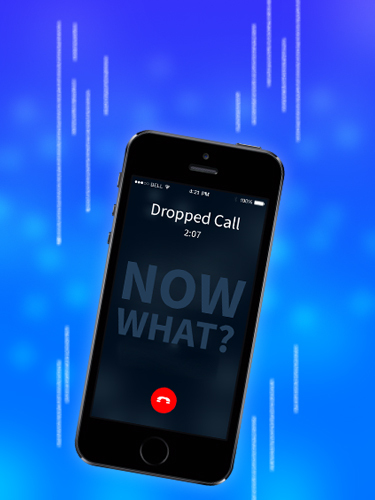 Another option to respond to dropped calls is to phone the customer back automatically, play an apology prompt, and ask them if they have all the information they need. If not, the call can invite them to continue where they left off. VBVoice offers dual channel developing – allowing you to develop a call flow in a visual format as well as the traditional voice format. Using VBVoice and Pronexus' Visual IVR development tool VisualConnect, you can develop an IVR that sends a text to customers with a message like the following: "We seem to be having trouble – would you like to continue this call in a visual format?" and offer customers a web link via SMS, where they can continue the call on another channel – this time, a data channel. If the call was dropped due to a poor telephone connection, the new channel will prevent the same problem from occurring. These are just three simple ways to engage employees and turn a frustrating situation in to a positive one – increasing your company's likeability and even encouraging customers to use your IVR more, keeping calls out of your call center.